Perfect for everyday office and home use, the Ricoh MP 3555SP printer is known for its efficiency and intuitive interface. This three-in-one printer, copier and scanner incorporates advanced technological features, making everyday tasks effortless and instant. The innovative touch screen panel allows the user to easily customise their document to create a professional-looking finish for all projects. The effective high-speed machine prints up to 35 copies per minute. It is ideal for all fast past office needs. Measuring 23.1 x 26.9 x 35.9 inches, the Ricoh MP3555SP features a slim-lined design and a 10.1-inch Smart Operation Panel. The printer includes a powerful Intel processor, which complements the 2GB RAM and 320GB HDD system memory. The high capacity paper tray holds up to 4,700 sheets with the added convenience of a 1,000-sheet staple and staple-less hybrid finisher. Large scale scanning is made easy with the Ricoh MP 3555SP thanks to an automatic and single pass document feeder for efficient and instant document scanning. The Ricoh MP 3555SP is a complete up-to-date machine designed to make everyday tasks quick and effortless. The wide range of integrated technology makes it a breeze for most business and home needs. The added advanced security controls protect data and account information, which ensures peace of mind for the user. 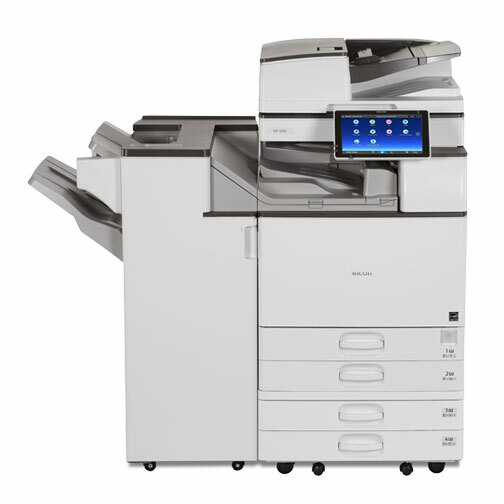 Despite its wide range of advanced technological features, the Ricoh MP3555SP does not print or copy in colour. As a black and white only device, this may restrict the type of user or projects this machine can be used to complete. However, it does have the capacity to scan in colour which may sway some users. In addition, the device requires a Wi-Fi network to operate many of its headline functions. Users who prefer to use an Ethernet cable for internet connection may not be able to use this device.